As a brand new creative and digital centre based on the University of Wales Trinity Saint David campus in Carmarthen, Yr Egin is here to serve Wales, inspire creativity and imagination, and foster talent for the future. Canolfan S4C Yr Egin is located in the oldest town in Wales and within a 90 minute journey to around 65% of all Welsh speakers in Wales. In October 2018 the centre was opened by First Minister Carwyn Jones AM and there was a celebratory parade through the streets of Carmarthen. Yr Egin is a creative centre, one the whole of Wales can be proud. In March 2014, following a strong competitive process, the S4C Authority confirmed that the Channel’s headquarters would be relocated to the University of Wales Trinity Saint David’s campus in Carmarthen as part of a new creative centre – Canolfan S4C Yr Egin – home to a cluster of companies and organisations from the creative industries. There was close collaboration between UWTSD, S4C and the creative sector during the process of designing the building to ensure a space was created where the vision could be realised. Rural Office for Architecture and BDP were the architects and the successful partnership has given rise to a contemporary landmark that is a fantastic workplace that supports collaboration,communication and networking between all the buildings users. The design is based on the close relationship between the University, the tenants of the Centre and the wider community. This relationship, or trinity, is reflected in the design of the building: a simple triangular form that grows out of the earth and soil of Carmarthenshire. One of the aims of establishing Yr Egin was to act as a catalyst for promoting and strengthening the regeneration of the Welsh language within Carmarthenshire. There’s close collaboration between Yr Egin, Yr Atom – Carmarthen’s Welsh centre – and Rhagoriaith – University of Wales Trinity Saint David’s Welsh Language Services Centre – as well as other partners to in order to achieve this. 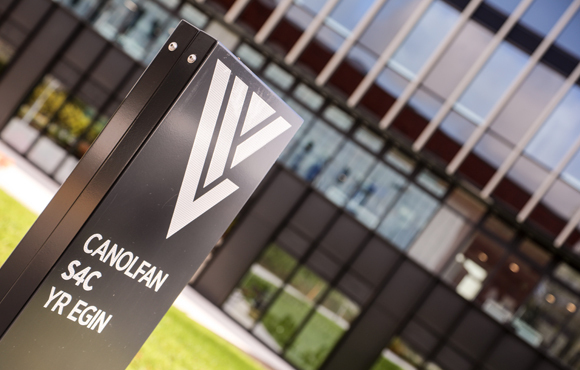 Canolfan S4C Yr Egin is a landmark development, serving its community and ignitniting Wales’ creative future. To inspire and revitalise a variety of social and community groups across the region. Carys is responsible for developing the creative hub, this includes the centre’s activity programme, performance space and office hire, along with its creative output. Don’t hesitate to get in touch if you have an interesting project idea, if you are looking for office space or a great place to hold your event. As a digital and creative hub, Yr Egin offers state-of-the-art resources and technology, and Jason is a master of them all. He has a flair for anything that has a picture, sound or is linked to the internet, and makes it all look so easy and effective. Please refer any queries on technological resources to Jason. Carys Haf is the person who will greet you warmly at reception or over the phone. Along with Lowri, Carys deals with venue hire enquires regarding the centre’s facilities and spaces. Carys Haf also coordinates group visits and helps to market Yr Egin’s events programme. Lowri Sion’s smile will be the first thing you see when you step in to Yr Egin. Along with Carys Haf, she will help you at every step when you hire facilities and organise activities at Yr Egin. She has a passion for working creatively with children and Lowri plans and coordinates the centre’s educational workshops for people of all ages.